Too much sediments in my coffee from Breville DB !!! Thread: Too much sediments in my coffee from Breville DB !!! I'm a newbie in coffee extraction. Purchased the Breville DB 920 with Smart Grinder (Dynamic Duo model) about 7-8 months back. I usually have 1 cup/ day. Last 2-3 months I am noticing drastic deterioration of my coffee extraction. I am getting lots of sediments / scum on my coffee that really tastes & looks horrible. Seeking advise from the experts on what I could be doing wrong.. I cant understand why I am having so much sediments / scum. 2) I clean my portafilter and basket after use as I thought sediments trapped in baskets may be the cause of it. 3) I wipe the shower screen after every use. 4) The coffee that I use is medium roast, on subscription and is fresh. 6) My Smart Grinder setting is between 18-20. If I go lower then flow reduces. 8) Froth my milk using thermometer to 55 degrees. Milk is A2 full cream. I still cant understand where is the sediments / scum coming from. 20g dose / 20g yield from 20g VST in 25sec from a smart grinder and medium roast whatever that means....grind is probably way too fine. Adjust grind coarser so that you get 60g from the 20g dose in 35 sec. Taste this, is it less bitter? Cleaner? Repeat stopping the shot sooner 30sec, 28, etc until it tastes sour. Once you have your preferred yield, then try grinding a touch finer and taste again too see if it improves. Thanks for your response. I thought 20 grind setting on a Smart Grinder is very coarse already. OK I will try at setting coarser and see what happens. That sounds like you are grinding way too fine. 20g of coffee output from 20g of grounds is a very constipated shot of espresso. It sounds like the extremely fine ground coffee is pushing right through the basket and into the cup, so you are ending up with sediment like you get in Turkish coffee. As per post above, open up the grind. You’ll likely find that the shot tastes far better, with improved flavour separation and clarity of taste. Where is the sediment? I only see bubbles, which in my experience are a sign of freshly roasted coffee. Are you waiting until approximately 7 days past the roast date before opening the bag? Your brew ratio is also quite low as the other poster points out. 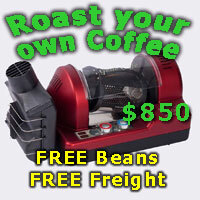 Normally you'd start at around 2x to 3x the output compared to the weight of coffee used. Hi herzog & zeezaw, thanks for your feedback. I will increase the grind setting and see the difference. I am following a flat white recipe from one of the you tube channels. so extracting ristretto instead of an expresso. The coffee is about 10 days old. What I am confused is the appearance of dark circles after pouring the milk. Looks terrible. This is something which has been happening recently. I would also suggest to put the milk away when you are trying to troubleshoot your shots. Taste your straight espresso, experiment and repeat. Adding it to a bucket of milk will hide a lot of flaws in the shots, making it difficult to fix the issues. When I had my la cimbali, if I neglected to do a cooling flush I'd get those big bubbles in my shots. I know you only have it on 92 but maybe try lowering the temp a few degrees and see if that helps? I tried all the way from 25 downwards on my grinder and now settled at 22. At 25 flow was too fast. Grinder setting 22 instead of 19-20. Sediments much lower and now at the bottom of cup. I continue fine tuning my extraction. inorog and magnafunk like this.